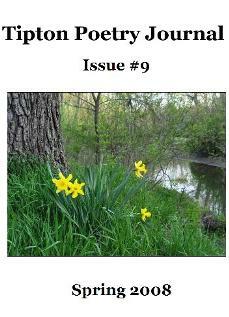 Issue #9 of the Tipton Poetry Journal has been published and is available now in both print and online versions. Contributors for the Spring issue include: William Aarnes, Joop Bersee,,Richard Alan Bunch, Dan Carpenter, Brooklyn Copeland, Mariana Dan,,Rosemarie Dombrowski, E. Laura Golberg, Gary Hanna, Mary Hawley, Mary,Crockett Hill, Tom Holmes, Paul Hostovsky, Allan Johnston, Jack,Kristiansen, Jean Lehrman, Bonnie Maurer, Rohana McCormack, Corey Mesler,,Marlene Million, Tracy Mishkin, Jessica Morrow, Kristine Ong Muslim, Tonya,Northenor, James Owens, Simon Perchik, Allan Peterson, Richard Pflum,,Stephen R. Roberts, Dennis Saleh, Elizabeth Schultz, Clint Smith, Janice,D. Soderling, Adam J. Sorkin, Jeanine Stevens, Michael E. Strosahl, Rohith,Sundararaman, James Tipton, Jean Tucker, Karen Wolf and Gail Haruko,Yamauchi.